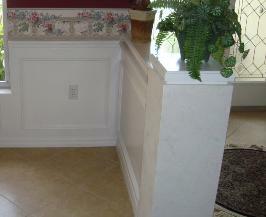 Millwork including Chair Rails Tampa Bay – We serve Hillsborough, Pinellas, Pasco and Hernando County. horizontal strips of molding known as chair rails. Chair rails, or chair rail molding, runs along the interior walls of many rooms, especially dining rooms, kitchens and other areas where chairs are commonly placed. 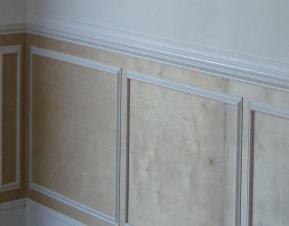 The original purpose of chair rails was to prevent the backs of standard chairs from damaging plaster walls. features. In some cases, chair rails have a groove along a back, bottom edge for mating with a panel, or wainscot. Installing a chair rail is a wonderful way to turn an ordinary room into an extraordinary room with minimal cost. For information regarding chair rails or for a free estimate, call Gloger Construction today.